This inflatable game can be an amazing centerpiece for any backyard party. The inflatable play structure takes participants up a climb and down a slide and past pop-ups to facilitate maneuvering skills and build confidence. 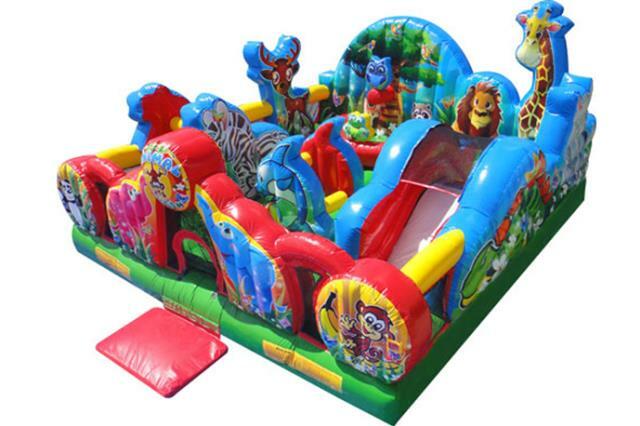 The inflatable play structure guarantees hours of enjoyable physical activity. This Inflatable unit is constructed of the fire-resistant, lite n' strong vinyl for easy portability, durability and safety. **NOTE: THIS BOUNCER IS DESIGNED FOR KIDS 4 YEARS OF AGE AND YOUNGER ONLY. * Please call us for any questions on our animal kingdom toddlerzone rentals in Rocky Mount and Wilson NC.